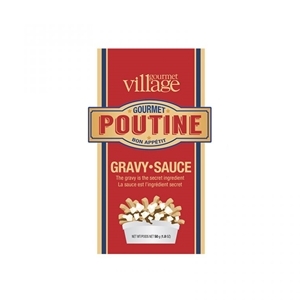 A French-Canadian dish traditionally made of French Fries and fresh cheese curds, covered with gravy. The gravy is the secret, a real taste treat.Enjoy a decadent taste, we all have to indulge ourselves sometimes.Try jazzing it up by making the sauce with your favorite brew & top it off with Pulled Pork.Store in a cool, dry place.Store in a cool, dry place. What you Need:Make 4 double serving (1 just isn’t enough).- contents of pouch of Poutine Sauce mix- 500 ml (2 cups) cold water - Fries for 4 (with skin on is best)- 375 g fresh Cheese Curds. What to do: Bake or fry 4 servings of fries until golden and crispy. While they’re cooking, make the Poutine sauce. In a saucepan, combine sauce mix & cold water stirring constantly with a whisk. Bring to a boil, reduce heat and simmer for 3 minutes. Divide the fries between four bowls, top with cheese curds and pour 125 ml (½ cup) of sauce over each serving. Enjoy a true French Canadian classic! You can substitute the water with 2 cups of beer & ½ cup of water for a Beer Poutine. Top with Pulled Pork for a Pulled Pork Poutine. Ingredients: Modified corn starch, flour (wheat), salt, corn syrup solids, hydrolyzed plant protein (soy, corn), colour (paprika extract, caramel), spices, canola oil, natural flavour (includes chicken), onion powder, citric acid, yeast extract.